Renew or join now, and invite your colleagues to take part in this exciting offer! Current professional members are encouraged to recruit at least one new member to join at the professional level. For each new member that joins NCCA and indicates who referred them, the current member will be entered into a drawing (more recruits, more entries) to win a 5-year membership to NCCA. All new and renewing members are required to join online. The drawing will be held on July 8th. Current members must renew their membership before the June 28 deadline to be eligible to win. That is membership to NCCA and four divisions for the low cost of $60.00 (or $15.00 for student and emeritus members). The NCCA Membership year is July 1 through June 30. RENEW NOW (or before June 28) to receive the “Each One, Reach One” campaign benefits, and your membership will be extended through June 30, 2020. NCCA is pleased to announce 2019 Annual Award Winners presented at the NCCA Annual Conference February 21, 2019. NCCA Members: We are now collecting submissions for the Spring 2019 edition of the Carolina Counselor. Please consider submitting short articles, resource lists, personal reflections, pictures, news, and updates that you would like to share with members of our association. Deadline for submissions is February 22, 2019. 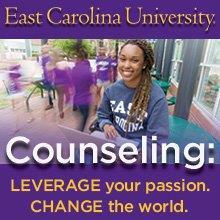 See our Carolina Counselor page for topics requested and submission guidelines. Make plans to join us at the NCCA Annual Conference February 20-22 in Durham. This annual event offers innovative pre-conference sessions and educational sessions centered on the theme “Counselors Committed to Advocacy”, plus social events and more. Visit the 2019 Annual Conference page for the latest information. The North Carolina Counseling Association wishes to recognize professional excellence and service. All members are urged to take a moment to reflect on the excellence of colleagues and consider nominating them to one of the annual awards to be presented at the 2019 NCCA Annual Conference, February 20-22, 2019, at the Durham Convention Center in Durham, NC. Nominations must be made by members of NCCA. Nominees must be members of NCCA. Exemptions to this requirement may be the Administrator of the Year and Special Citizen’s Merit Award. The awards nomination deadline is January 18, 2019. For more information about these awards and to submit a nomination, click HERE. The 2018 Conference was very successful! Photos & information from the event coming soon! The North Carolina Counseling Association wishes to recognize professional excellence and service in the field of counseling during 2017. This is a fantastic way to acknowledge the efforts and accomplishments of colleagues and fellow clinicians in the field. All members are urged to take a moment to reflect on the excellence of colleagues and consider nominating them to one of the annual awards to be presented at the 2018 NCCA Annual Conference, February 1-2, 2018, at the Durham Convention Center in Durham, NC.